Feel like you are already a guest at Home Port by watching the video located at the end of the photo gallery! Home Port is a charming oceanfront New England farmhouse located on Bass Harbor on Mount Desert Island, home of Acadia National Park and Bar Harbor. Home Port accommodates 6 in three bedrooms with 2 baths.It has a newly updated modern kitchen, and air conditioning. The quaint fishing harbor and mountains of Acadia is the view from the deck of this comfortable home. A dock and deep water mooring can be made available and we do provide a row boat for our tenants use. Kayaks are also available on the dock. For directions the physical address is 22 Columbia Ave, Bernard 04612. Biking, beaching, hiking, canoeing, kayaking,fishing right at your doorstep as well many other areas on Mount Desert Island. Whale watching from Bar Harbor just 20 minutes away. The stars from Cadillac is a must see. Fine dining is in all of our villages, SW Harbor, Bar Harbor, Northeast Harbor and Tremont.. Shopping in T Shirt Shops or for designer brands are available. The Gilley Museum of bird carving is located in SW Harbor. The Abbe is in Bar Harbor and there are several others to explore. Art fairs and musical groups are always available for your enjoyment. We are natives of MDI with 3 businesses that we operate. In addition to our eight rental properties, Steve is a master electrician with 6 or more employees and we operate a real estate firm with 6 agents. Our 2 children are grown and 4 grand children are almost grown. We enjoy boating the Maine coast, kayaking the local waters and walking the trails here on MDI. Our home away from home is Sarasota FL where we purchased a rental property at the Palm Bay Club on Siesta Key. For a warm retreat in the cold of winter reserve a vacation at our Fl condo. Our location on the water on the quiet side of MDI is only 25 minutes from the hustle and bustle of down town Bar Harbor on a day when the cruise ships are in. Entrances to the park are within 2 miles and Thurston's for lobster and Back Beach are within 1/2 a mile. The village of SW Harbor is just 3.6 miles from Bernard Rd where you'll find shops, banks, art shows on the green and restaurants. First floor bath is walk in shower only. Second floor is tub/shower combination. Downtown Southwest harbor is 3.6 miles away. Bicycles can be rented at SW Cycle in SW Harbor 3.5 miles aaway. There are 2 king bedrooms and one with 2 twins. We have a foam topper and can make the twins a king if requested. If you need something extra, just ask. I'll do my best to accommodate your needs. This house is lovely and had everything one would need. It is well laid out and I loved the working dock. When I first got here I thought I’d rent this place for a month next year. Loved the early sun coming in. However, it has no air conditioning and this really detracts from the comfort. I think Down Easter’s are the world’s greatest optimists saying you don’t really need air conditioning. However, I’ve been coming here off and on since 1986 and on many visits the residents are always saying “it’s not usually this hot.” If the owners would stick a unit in the side window (south) side of the living room and perhaps one in the ground floor bedroom (could be a portable unit), this house would be perfect. The house was perfect. It had everything we needed and such a cute cottage. The location idyllic. Such an amazing view of Bass Harbor and the boats. And a quaint town. We were very pleased and would love to return some day. House in great shape ...best for 4 people...6 ok if 2 are young kids not teens. We stayed mostly there to gaze at ocean, dock and boats. If you are going to roam all over MDI you’ll drive a lot. The place is a 3 mile drive/bike/run from the ferry pier and Maine-ly Delights restaurant (a local favorite for fish sandwiches, fries and soup) in Bass Harbor, and it's a short hop from there to the Bass Harbor Head Light House. Southwest Harbor is 12-15 min away with small shops and more local food options. We enjoyed the cool days (65-75F) and nights (45-55), the kids loved playing on the lawn, the gorgeous scenery righteous the back, and the dock with rowboat, canoe, and kayaks for our use. The Quiet Side is the best, and the Stanleys (property owners) have built a reputation of quality properties and outstanding service. THIS is the best place to stay on MDI!!! Thanks from the Burdons--a proud US Air Force & US Navy family! Fine property, smartly outfitted in an especially good location. All good. Would recommend to anyone . Clean, good harbor view, well supplied in kitchen, kayakes. Would recommend owner putting in renter notes to bring soap or have owner supply- that was the only surprise first day. Downstairs updates are good, may want to tackle upstairs bath. Acadia National Park has some of the most beautiful hikes and view on the east coast. The Park offers nature walks, naturalist cruises and lectures. Golf on 3 island courses, sailing, kayaking, biking, tennis, fishing, concerts, plays, art galleries, church fairs, interesting shops- all these and more are nearby for your enjoyment. We are located on the western side of MDI; the Quietside. Whale watching from Bar Harbor just 20 minutes away. The stars at Cadillac is a must see. Fine dining is in all of our villages, SW Harbor, Bar Harbor, Northeast Harbor and Tremont. Shopping at T Shirt Shops and designer brands are available. The Gilley Museum of bird carving is located in SW Harbor. The Abbe is in Bar Harbor and there are several others to explore. Art fairs and musical groups are always available for your enjoyment. I, the owner, am a native of this lovely island and have visited a few different places, but have found none any more beautiful than Mount Desert Island. 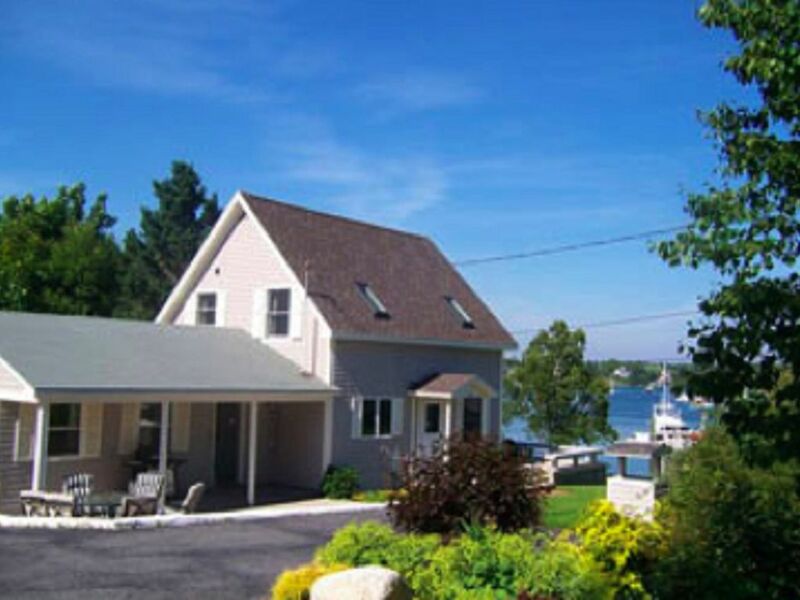 We have other cottages for rent so if this calendar is full contact us for availability at our other nearby locations, Bass Harbor, Hodgdon Pond and SW Harbor.